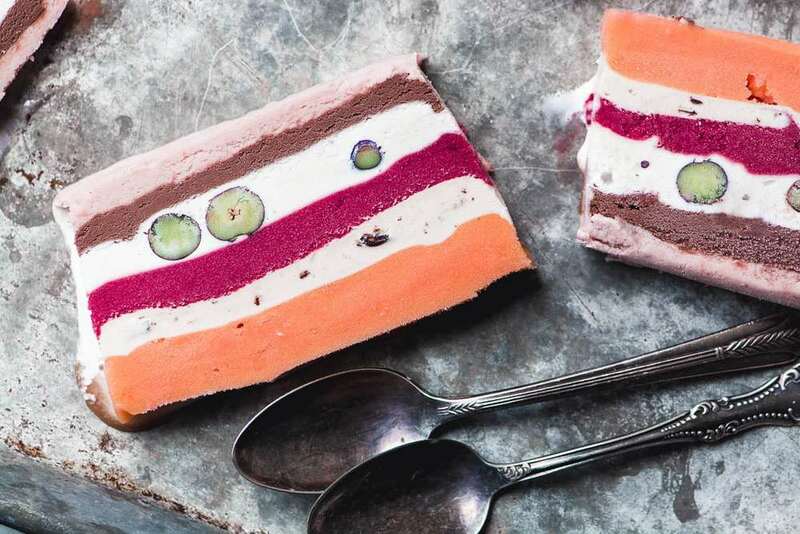 How to make an Ice Cream Terrine ~ layered ice cream desserts are fun and easy to do, create your own customized ice cream cake in a few easy steps! Line a standard loaf pan with plastic wrap or parchment paper. Make sure to leave long ends extending so you can lift the frozen cake out for cutting. Starting with your first layer, take out the ice cream from the freezer and put it int a small bowl. Mash it with a spoon until it becomes a spreadable consistency. If your ice cream is super hard you can let it sit for a few minutes, first. Spread the softened ice cream out into an even layer across the bottom of the loaf pan. Put in the freezer to harden up, 30-40 minutes or so, depending on your freezer and the thickness of your layers. Do the same with each layer, freezing solid in between each one, until you have filled the loaf pan to the very top. Cover with plastic and put in the freezer for at least 2 hours, or until serving. To serve, lift the terrine out of the pan using the ends of the plastic wrap. Flip it upside down on a platter and carefully peel away the plastic. It's ready to slice and serve!